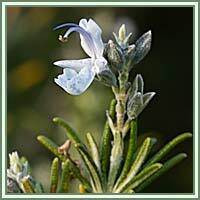 Habitat: Rosemary is native to the Mediterranean region. It grows in dry, sandy or rocky soils. Description: Rosemary is an evergreen woody shrub, growing up to 1.8 meters high. It has highly aromatic, needle-shaped leaves and gray, scaly bark. Leaves are dark-green on their upper-side, and paler and glandular on their underside. Flowers are small, pale blue in color, arranged in clusters of 2 to 3. Rosemary flowers appear during summer. The upper lip of Rosemary flower has two, and the lower lip has three lobes. Useful components: Iron, calcium, vitamin B6, carnosic acid, rosmarinic acid, camphor, caffeic acid, ursolic acid, betulinic acid, rosmaridiphenol, rosmanol. 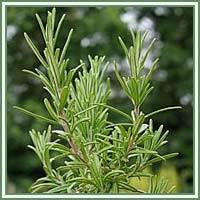 Medicinal use: Rosemary was traditionally used as an antiseptic, astringent and a food preservative. It is used in facial cleansers for oily skin, and in compresses in treatment of bruises and sprains. It is a very helpful muscle relaxant, and can relieve muscle cramps and improve circulation in the affected area. It also improves relaxation of muscles of the digestive tract and uterus. Therefore, it can be used in cases of digestive complaints and menstrual cramps. Some studies suggest Rosemary’s beneficial effects on our brain. Carnosic acid, one of the components found in Rosemary, can protect our brain from free radicals, thus being helpful as prevention against strokes and neurodegenerative diseases. Used in aromatherapy, Rosemary oil is said to improve concentration and memory.